The best brushes for pups vary depending on the coat type. Your puppy's fur is soft and silky, but we know that eventually the adult coat will replace the soft feel of his puppy fur. Keep your puppy's hair soft with daily brushing, a nutrient-dense diet, pH-balanced shampoo and conditioner. Your pup will love the added attention. Brush your puppy daily. If your pup has long hair on top and wooly fur underneath, he needs daily brushing to prevent matting while keeping the hair soft and tangle-free. The same is true with curly-haired pups such as poodles. Shorthaired pups benefit from daily brushing too, because it helps distribute the oils in the skin and keeps the hair clean and soft. Feed your pup a nutrient-dense puppy food. Nutrient-dense foods have no fillers and are complete and balanced. Complete and balanced dog foods contain all the nutrients a growing pup needs, in the right amounts. Quality puppy food provides lean protein, digestible carbohydrates, omega-3 and omega-6 fatty acids, minerals and vitamins to help maintain a healthy coat. Shampoo your pup with a pH-balanced puppy shampoo. Do not use human shampoo, because the pH is not right for pups. 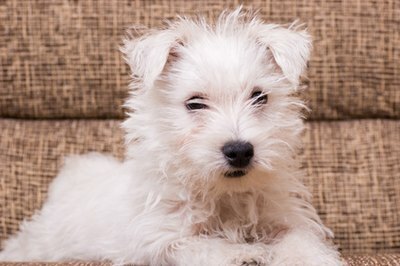 Unless your veterinarian recommends them, avoid medicated shampoos or flea shampoos, which may be too harsh for a young pup. Use a conditioner after your pup's bath. Try one with chamomile and aloe to help moisturize the puppy's coat and keep it soft. Some conditioners you apply and wash out of your pup's fur. Some are sprayed on and air-dried. Avoid bathing your puppy too often. Frequent bathing will strip the natural oil from the skin, and can make the fur dull. Unless he gets into something, a pup shouldn't need bathing more often than once a month. Choose a brush that suits your pup's fur best. A short-haired dog doesn't need a wire brush. Let your dog sniff the brush until his curiosity is satisfied before you begin. Brush lightly. Give him time to get used to being brushed. Brush your puppy's hair in the direction of hair growth. Quality pet foods are available in pet stores and through your veterinarian. If you are changing foods from what the puppy's breeder used, introduce the new food gradually over a couple of weeks to avoid digestive problems. Don't add supplements to your pup's dog food, such as oil to improve his coat. Talk with your vet first. If your pup is eating a complete and balanced dog food, he has all the supplements he needs. Human baby shampoo is not pH balanced for your pup's hair. Do Kittens Shed Baby Hair? What Does a Kitten Look Like When It Is First Born?